SpeedSport Promotions : The Speedsport Gallery Opens ! The Speedsport Gallery Opens ! After months of planning, our gallery above the Speedsport workshops is opening for business on Friday July 23rd. Mike's passion for motor sport, especially the 1960s, is reflected in the high quality paintings, posters, photographs and autographs which we have for sale. 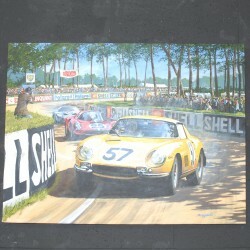 Original paintings by world acclaimed artists such as Dexter Brown, Michael Turner and Frank Wootton hang beside wonderful technical drawings and an eclectic array of iconic motor racing images. Our special cabinet houses a treasure trove of valuable autographs including Mike Hawthorn, Peter Collins, Jim Clark, Piers Courage, Roger Williamson and many other famous racing names. These autographed items are fast becoming a secure investment as well as a lovely piece of racing history to feel proud to own. We will eventually be launching a separate website for the gallery, but in the meantime please try to call in to have a look. This weekend's opening coincides with the Silverstone Classic race meeting, so please contact us if you would like tickets to attend.